Company aims to begin drilling in Arctic Ocean this summer. The U.S. government on Monday conditionally approved a plan by Royal Dutch Shell PLC to drill in the Arctic Ocean this summer, removing one of the biggest obstacles the energy company must overcome before it can explore for oil and natural gas in the Arctic’s frigid, isolated waters. The conditional approval from the Interior Department is contingent on Shell obtaining several additional federal permits, approvals Shell hopes government officials will make in the coming weeks. Other obstacles, including ongoing legal battles brought by environmental groups and an effort by Seattle officials to keep Shell from using the city’s port to keep its drill ships, could delay Shell’s plan. Shell plans to invest $1 billion in its Arctic project this year, adding to the $6 billion the company has already spent on exploration drilling offshore Alaska in the past eight years. Its only successful drilling attempt since 2007 was hindered by bad weather and mechanical failures. The region’s cold climate provides a brief window—generally from July to October—when companies can drill safely given the icy conditions the rest of the year. Shell is seeking approval to drill up to six exploratory wells in the U.S. portion of the Chukchi Sea, off the West Coast of Alaska between the U.S. and Russia. No energy company currently is drilling in the U.S. portion of the Arctic Ocean. 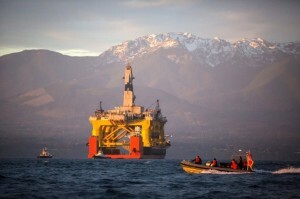 Shell’s Arctic plans are currently the company’s largest, most high-profile and expensive exploration project.